[ABOVE] A portrait of the boxer Jem Mace (1831-1910). 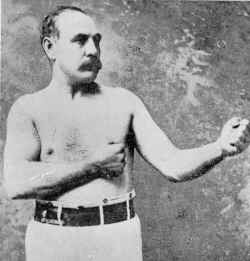 It is reported that the photographer Frederick William Nichols was a patron of boxing and a "backer" of well known boxers such as Jem Mace and Tom Sayers (see below). 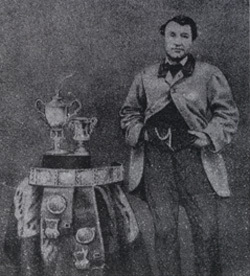 [ABOVE] A lithographic print of Tom Sayers (1826-1865) with his boxing trophies, silver cups and championship belts. This lithograph, which was made from a studio photograph, was published in 1860 by George Webb of London. Frederick William Nichols is known to have taken a number of photographs of Tom Sayers, from 1849 to 1860 the "Boxing Champion of England". Commenting on the photographic portraits of Tom Sayers, Henry Downes Miles, the author of "Pugilistica" - 150 Years of British Boxing" (1863), wrote : "The photographs which figure in the print-shop windows do not convey a fair idea of Tom's good-tempered and merry expression." Frederick William Nichols was born in St Neots, Huntingdonshire, between 1832 and 1836. The research of the London Photo-historian David Webb (reported on the photoLondon database website) has indicated that Frederick William Nichols was operating as a photographer in a shop next to the Alhambra Theatre in London's Leicester Square in the 1860s. 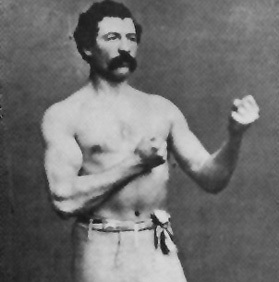 It appears that Frederick W. Nichols was keenly interested in boxing and according to David Webb, the photographer was closely involved in the careers of three famous boxers of the day - Jem Mace (1831-1910), Tom Sayers (1826-1865) and the American boxer John Carmel Heenan (1835-1873). When Tom Sayers fought John C. Heenan at Farnborough on 17th April 1860, Frederick Nichols was one of only three photographers permitted to record the contest with a camera. 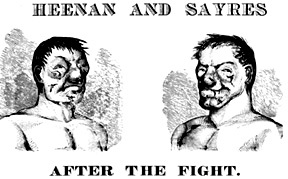 [ABOVE] A print published in 1860 showing the facial damage sustained by John C. Heenan and Tom Sayers (mis-spelt "Sayres") during their epic bare-knuckle boxing contest at Farnborough on 17th April 1860, a fight which lasted over two hours. The photographer Frederick William Nichols was present at the fight to record the boxers with his camera. According to the boxing writer Tom Sawyer, photography "enabled 'mug shots' to be taken immediately after an important fight, for sale to a public appreciative of contusions, cauliflower ears, bunged-up eyes and split lips." The photographic images were sometimes made into wood printing blocks for reproduction, "although an engraver might enhance injuries and thereby encourage sales". By 1865, Frederick Nichols was married and living in Tenterden, Kent, where his son Arthur Nichols was born around that year. Frederick Nichols' wife was a woman named Eliza, who was born in London around 1833. [A marriage between a Frederick William Nichols and an Eliza Gurling was registered in the St George Hanover Square district of London during the 4th Quarter of 1865, but there is no supporting evidence to indicate that this is a record of the photographer's marriage]. By about 1873, Nichols was working as a photographer in Sussex. Frederick William Nichols was recorded as a photographer in Seaford in the Commercial Section of Kelly's 1874 Directory of Sussex. 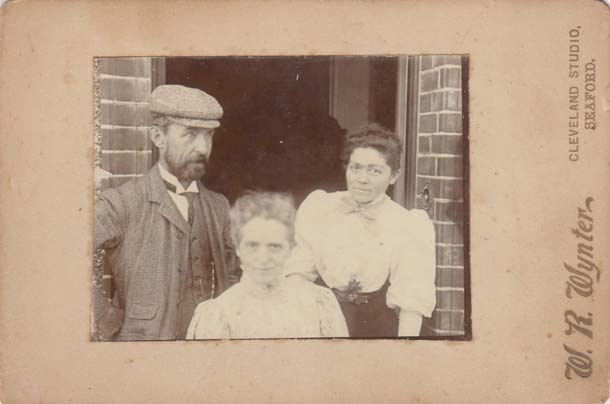 When the 1881 census was taken on 3rd April 1881, Frederick William Nichols was residing at Alma Place in Hadlow, Kent with his forty-eight year old wife Eliza and their sixteen year old son son Arthur. Frederick William Nichols is entered on the return as a "Photographer", aged 45. According to a transcription of the return, the census enumerator recorded Frederick Nichols' place of birth as "St. Neots, Hants". ( This is possibly a transcription error - "Hunts" being written down as "Hants"). Twenty years later, when the 1901 census was carried out, Fred W. Nicholls (Nichols) is recorded in Tonbridge, Kent. Nichols gives his occupation as an "Engraver and Rubber stamp Agent". This time, the census enumerator has recorded Frederick Nichols' age as 68 and his place of birth as "Huntingdon, St. Neots". According to David Webb, the London Photo-Historian, Frederick William Nichols died in Tunbridge Wells in August 1902. The death of Frederick William Nichols, aged 70, was registered in the Tunbridge District (which includes Tunbridge Wells in Kent) during the 3rd Quarter of 1902. 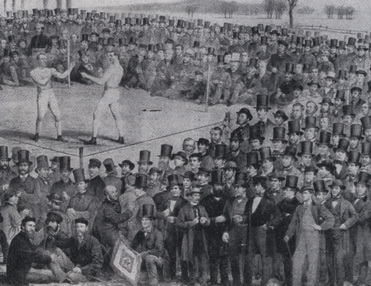 According to the London Photo-Historian David Webb, Frederick William Nichols was one of only three photographers permitted to make a photographic record of the famous boxing match between the English boxing champion Tom Sayers and the American boxer John C. Heenan, which took place in a field at Farnborough on 17th April 1860. Tom Sayers, who had been born in Brighton on 25th May 1826, was about 5' 8" in height and weighed around 154 pounds at the time of the fight. Sayers was therefore seven years older, about five inches smaller, and around 41 pounds (3 stones) lighter than the twenty-five year old Heenan, who was 6' 2" tall and weighed around 195 pounds. Sayers and Heenan fought for two hours and six minutes over thirty-seven rounds, before the contest was interrupted when supporters cut the ropes of the ring. The two boxers, both badly injured, battled on for another five rounds, but before the fight could be settled, the contest was broken up by police. The boxing match was declared a draw and both fighters were later presented with silver championship belts. [ABOVE] A photographic portrait of the boxer Tom Sayers (1826-1865). Thomas Sayers, the son of a shoemaker, was born in Brighton in 1826 and attended Brighton's Middle Street School. A bricklayer by trade, Tom Sayers began his boxing career in 1849. 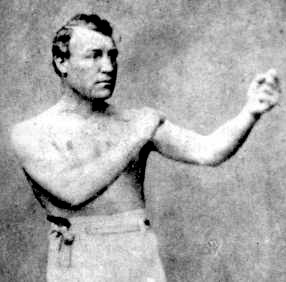 After a single defeat by Nat Langham in 1853, Sayers went on to win his every fight during the remainder of that decade. After he defeated William Perry, "The Tipton Slasher", in 1857, Tom Sayers was declared the "Heavyweight Champion of England", despite the fact that Sayers was only just over 5' 8" in height and weighed less than 11 stone. Known as the "Little Wonder" and dubbed "the Napoleon of the Prize ring", Tom Sayers won all of his fights between 1853 and 1860, the year he was challenged by the American boxer John C. Heenan. After the inconclusive outcome of the famous contest between Sayers and Heenan at Farnborough on 17th April 1860, Tom Sayers was persuaded to give up prize fighting. A public subscription of �3000 pounds was presented to Sayers on the condition that he retired from boxing. Tom Sayers died from diabetes and tuberculosis on 8th November 1865, at the age of 39. [ABOVE] Detail from a coloured lithographic print entitled "The International Contest Between Heenan and Sayers at Farnborough, on the 17th of April 1860", published by George Newbold of London on 5th November 1860. This view of the famous boxing contest between Brighton-born Tom Sayers and the American boxer John C. Heenan was drawn by the lithographer W. L. Walton, using "upward of 250 portraits from photographs taken especially for this work". The majority of the fashionable spectators were photographed in the studio of the London photographer Watkins* and later combined in a montage by the lithographer. However, the two boxers in the ring might have posed for the photographer Frederick William Nichols who was present at the fight. Another representation of the fight, entitled �The Great Contest Between Sayers and Heenan for £200 Aside and the Championship�, was produced as a coloured engraving by Rowbotham & Brown. For the Rowbotham & Brown version, the portraits of the 100 spectators in the foreground had been individually photographed by George Bonner of London. * The photographer was either George Herbert Watkins (born c1828, Crowle,Worcs. 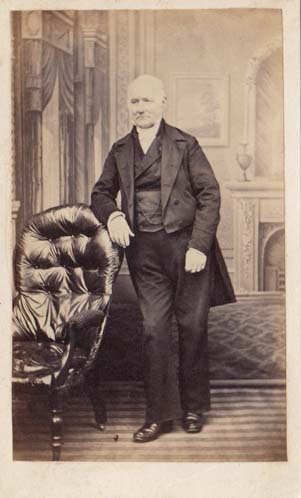 ), his brother Octavius Charles Watkins (1836-1882) or John Watkins (1823-1874). [ABOVE] A photographic portrait of the American boxer John Carmel Heenan (1835-1873). This portrait was taken around 1863, a few years after the American boxer's famous fight with Tom Sayers. The son of Irish immigrant parents, John Carmel Heenan was born in Troy, New York on 2nd May 1835. An unskilled labourer, Heenan moved to Benicia, California to do heavy manual work in the workshop of a steamship company. Nicknamed "The Benicia Boy", Heenan had his first major fight in 1858 with the American Heavyweight Champion John Morrissey. Although he was defeated by Morrissey, Heenan challenged Thomas Sayers, who was regarded as the "Boxing Champion of the World". After the inconclusive contest at Farnborough, Heenan remained on good terms with his opponent Sayers and they toured England together. After his defeat by Tom King, the English Heavyweight Champion, at Wadhurst, Sussex, in 1863, Heenan retired from boxing. There was a rapid decline in Heenan's health and he died in Wyoming in 1873 aged 38. 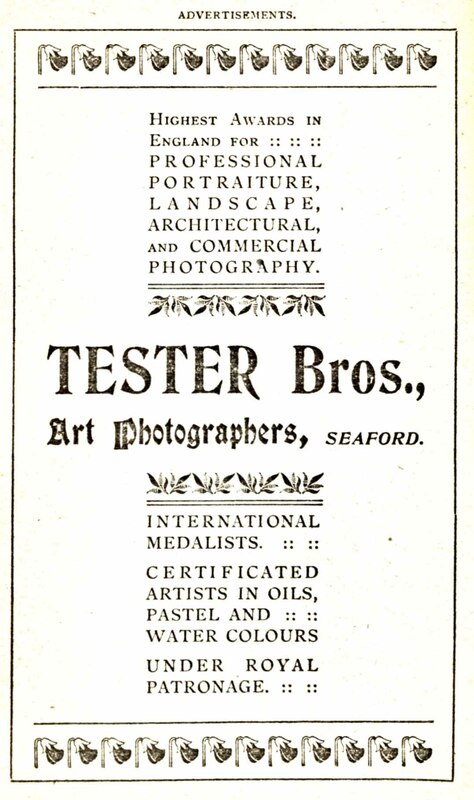 [ABOVE] An advertisement for Tester Brothers, Art Photographers of Seaford, which appeared in the book Seaford of the Past by W. R. Wynter and F. R. Gale, published in 1914. Herbert Tester and Louis (Lewis) Tester were brothers who set up a photographic studio at 11 Clinton Place, Seaford around 1904. The two brothers had previously worked as photographers in Burgess Hill, Sussex. Herbert Tester and Lewis Tester were the sons of George and Mary Tester of Maidstone, Kent. Their father, George Tester (born 1841, East Peckham, Kent) worked as a gardener in the Maidstone and Tunbridge areas of Kent. In 1864, George Tester married Mary Ann Ravilious (born c1843, Tunbridge, Kent). George and Mary Tester had at least seven children. 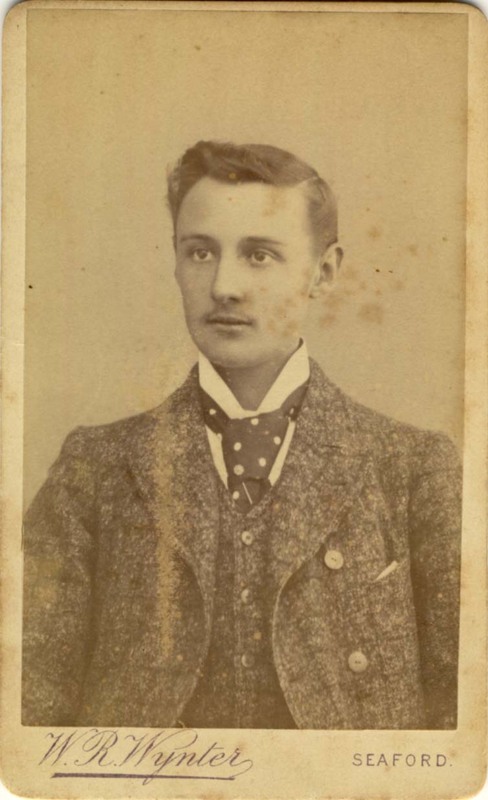 Herbert Tester, the second eldest son, was born in Maidstone during the 4th Quarter of 1868. Louis Tester, often known as Lewis Tester, was about ten years younger than Herbert. Louis Edward Tester was born in Maidstone in 1879 (birth registered in Maidstone during the 3rd Quarter of 1879). Another brother, Edwin John Tester (born 1872, Tunbridge, Kent), also became a photographer. Edwin John Tester is listed as a photographer with a studio at 3 Bridge Terrace, Maidstone in a 1904 trade directory. Other siblings included Alice Tester (born 1864 Tunbridge), Fred John Tester (born 1867 Maidstone), Annie May Tester (born 1875, Snodland) and Sydney Tester (born 1877, Maidstone). By around 1890, Herbert Tester was probably working and living in the Burgess Hill area of West Sussex. In 1891, Herbert Tester married a local woman named Roma Agnes Bryant. [Marriage registered in the District of Cuckfield during the 4th Quarter of 1891]. Roma Agnes Bryant (born c1868, Keymer (Burgess Hill), Sussex) was the daughter of Anne and William Bryant, a "builder, contractor, brick maker & dealer in all kinds of building materials" based at Dunstall Farm, Burgess Hill. Towards the end of 1892, Mrs Roma Tester gave birth to a daughter named Ivy May Tester [birth registered in the District of Cuckfield during the 4th Quarter of 1892]. A second daughter, Daisy Hilda Tester was born in Burgess Hill a year or so later [birth registered in the District of Cuckfield during the 3rd Quarter of 1894]. Gladys Roma Tester, the couple's third child, was born in 1899 [birth registered in the District of Cuckfield during the 4th Quarter of 1899]. By 1895, Herbert Tester had opened a shop in Church Road, Burgess Hill, where he worked as a gilder and sign writer. In Kelly's 1899 Directory of Sussex, Herbert Tester is listed as a "sign writer & stationer" in Church Road, Burgess Hill. 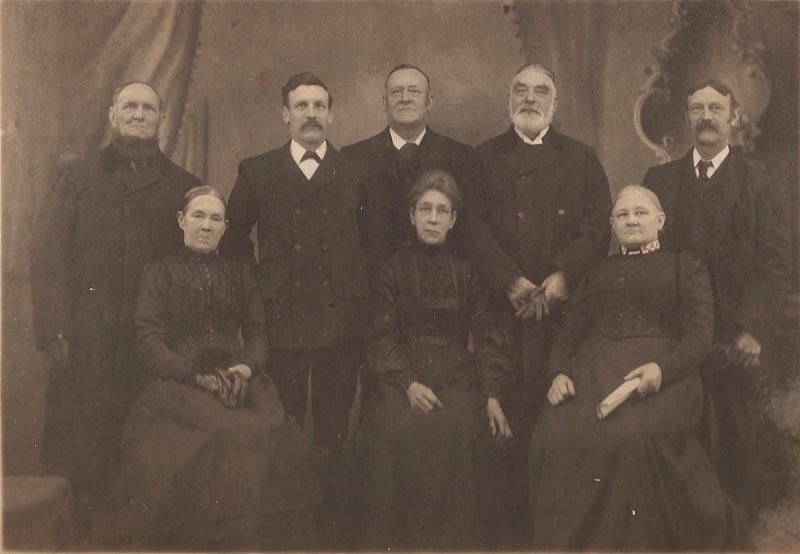 When the census was taken on 31st March 1901, Herbert Tester was recorded at his home in Church Road, Burgess Hill, with his wife Roma and their three children, Ivy, aged 8, Daisy, aged 6, and one year old Gladys. Herbert Tester gave his occupation as "Sign Writer & Photographer". Sharing Herbert Tester's home was his younger brother, twenty-two year old Lewis Tester, described on the census return as a "Photographer (own account)". Around this time, Herbert Tester and Lewis (Louis) Tester, together with their brother Edwin John Tester, formed the photography firm of Tester Brothers. Kelly's 1903 Directory of Sussex lists the Tester Brothers as 'Photographers' at Church Road, Burgess Hill. By this date, the Tester Brothers were also operating a photographic studio at 3 Bridge Terrace, The Broadway, Maidstone, Kent. The Maidstone branch studio of the Tester Brothers was probably managed by Edwin John Tester, who in the 1901 census is recorded as a twenty-eight year old photographer based in Maidstone. In the 'Street Directory' section of the Kent Messenger's Directory of Maidstone, issued in 1904, Edwin John Tester is recorded alongside his father George Tester at 3 Bridge Terrace, Maidstone. The Commercial section of the same directory lists the Tester Brothers, Photographers, at the same address. Tester Brothers, Photographers, were still listed at 3 Bridge Terrace, Maidstone in Kelly's 1913 Directory of Kent. Herbert and Lewis Tester operated the photographic studio at Church Road, Burgess Hill, until about 1904. Around 1904, Herbert Tester and Lewis Tester moved from Burgess Hill to Seaford, where they established a Cycle Shop in Seaford's High Street. Local trade directories have entries for "Tester Brothers, Cycle Agents" at High Street, Seaford, in 1904 and 1905. Shortly afterwards, Herbert Tester and Lewis Tester established a photographic portrait studio in Clinton Place, Seaford. Kelly's Directory of Sussex lists the Tester Brothers as Photographers at 11 Clinton Place, Seaford in the 1905 edition of the directory. [ABOVE] The trade plate of the Tester Brothers of Seaford, as embossed on the border of one of their photographic mounts (c1905). The Tester Brothers were listed as 'Photographers' at 11 Clinton Place, Seaford in local trade directories from 1905 until 1918. Clinton Place was a row of terraced houses that had been laid out near the Seaford Railway Terminus in the nineteenth century. Originally private houses, the row of buildings on the south side of Clinton Place were gradually converted into a parade of shops. Herbert Tester and his brother Lewis (Louis) Tester closed their cycle shop in Seaford's High Street and established a photographic portrait studio at No. 11 Clinton Place, diagonally opposite the Congregational Church, near the junction with Broad Street. The Tester Brothers styled themselves as "Art Photographers" in their publicity. Advertisements for the Tester Brothers studio proclaimed their achievements in photography, stating that they had won "the highest awards in England for Professional Portraiture, Landscape, Architectural, and Commercial Photography" and that they were "under Royal Patronage". The Tester Brothers mention in their advertisements that they were "International Medallists", a reference to the fact that they were (in their own words) "the only photographers awarded the International Bronze Medal for portraiture" in 1906. [ABOVE] A picture postcard showing the south side of Clinton Place, Seaford, around 1910. The Tester Brothers ran a photographic studio in this parade of shops at 11 Clinton Parade, Seaford, from around 1905 until about 1918. The Tester Brothers photographic studio was located at the far end of the row of terraced buildings pictured above. The woman and boy on the right of the picture are standing outside William Woolgar's ironmonger's shop at No. 1 Clinton Parade. The trees that lined the pavement and the ornate iron balcony rails above the shop fronts, made Clinton Place a particularly attractive shopping street. The ornamental balcony rails and rows of trees were removed in the 1930s. [ABOVE] A recent photograph of 11 Clinton Place, Seaford (2007). The Tester Brothers' studio is now used as a restaurant. A comparison with the much earlier photograph of 11 Clinton Place, shown on the right, reveals the changes that have been made to the building. The ornate iron balcony railings that can be seen above the fascia of the Kemp Brothers motor cycle shop were probably removed for scrap metal at the outbreak of the Second World War. [ABOVE] A photograph of the shop at 11 Clinton Place, taken after the Tester Brothers had left Seaford around 1920. 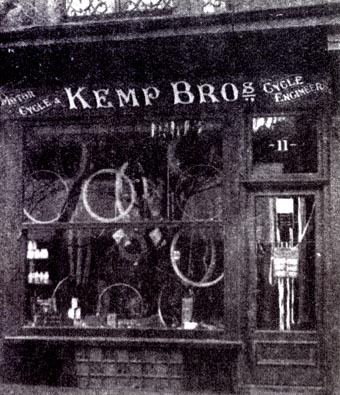 The new proprietors of the shop in the 1920s or 1930s were the Kemp Brothers, who were motor cycle dealers. Interestingly, the Tester Brothers were in business as cycle agents when they first arrived in Seaford around 1904. [ABOVE] A map of Seaford in 1909 showing the approximate location of the Tester Brothers' studio at 11 Clinton Place. When this row of terraced buildings was built in the nineteenth century it was named Terminus Place as it was close to the Seaford Railway Terminus. 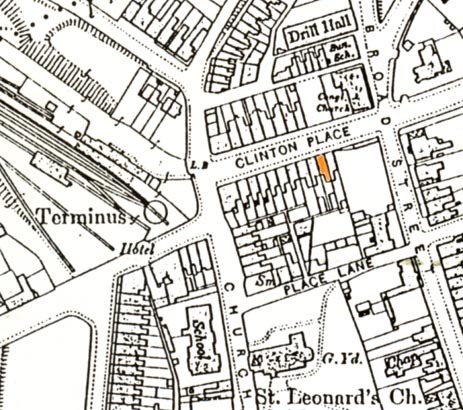 In the 1870s, Clinton Place stopped at the junction with Broad Street. Clinton Place is now on the main A259 road leading towards Eastbourne. The Tester Brothers are listed in local trade directories as professional photographers in Seaford up until 1918. The firm is not listed in Sussex directories from 1922 onward. Herbert Tester is recorded as a "Professional Photographer" at 11 Clinton Place, Seaford, at the time of the 1911 census. Unfortunately, I have not been able to trace Herbert's younger brother, Louis Tester, either in the 1911 census or any other records produced after 1901, including First World War records. Around 1914, the Tester Brothers produced a portrait of the musicologist Ernest Newlandsmith (born 1875) who had recently established an artistic Christian centre at Seaford Priory. The Tester Brothers photographic studio closed shortly after the end of the First World War. Herbert Tester died in 1957 at the age of 88. [ABOVE] Herbert Tester recorded as a "Professional Photographer" at 11 Clinton Place, Seaford, at the time of the 1911 Census. Herbert Tester lived with his wife and three daughters in living accommodation attached to his photographic studio. [ABOVE] Studio Portrait of a First World War Soldier (c1915). 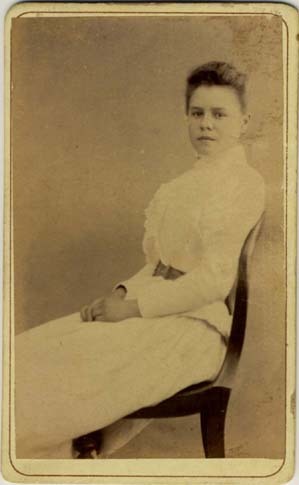 This portrait postcard is blind stamped "Tester Bros. SEAFORD " immediately below the photographic portrait. I am grateful to Robert Greenough for supplying the two photographs which are believed to represent members of the Cosstick family of Seaford. Bob Greenough's wife is descended from Eliza Louisa Cosstick (born 1875) who was connected to the Cosstick family of Seaford. Thanks also to Douglas Wilkie of Melbourne, Australia for providing additional information relating to the Cosstick family of Seaford. Mark Wynter was born at Eversholt, near Woburn, Bedfordshire, in 1827. He was the son of Hephzibah Wagstaff and George Jacob Wynter of Eversholt and was baptised in the village church on 12th October 1828. George Wynter (c1781-1873) and his wife Hephzibah (c1781-1850) had a number of children including Jacob (born c1813), Hephzibah (born 1815), twins Henry and Philip (born 1818), Jane (born 1822) and Robert (born c1828). George and Hephzibah Wynter moved to Wheathampstead, Hertfordshire, sometime in the 1840s. Mark Wynter's mother Hephzibah died at Wheathampstead on 12th May 1850 at the age of 69. The 1851 census shows George Jacob Wynter as a widowed "Annuitant", living at a house on Wheathampstead High Street with his two unmarried daughters - Hephzibah and Jane, both of whom give their profession as "Governess". (Hephzibah Wynter and Jane Wynter later established a boarding school at The Laurels, Wheathampstead. Miss Jane Wynter died in 1884, aged 62, but her elder sister Miss Hephzibah Wynter was the proprietor of the Ladies' School, Wheathampstead until her death in 1897 at the age of 81). By the time the 1851 census was taken, Mark Wynter had left home and was living in Sussex. Although his father George Jacob Wynter died at the ripe old age of 92, on 26th September 1873, Mark Wynter's brothers died young - Philip Wynter died in 1846 at the age of 28 and Henry Wynter, Philip's twin brother passed away on 13th February 1852 at the age of 33. By 1852, Mark Wynter was living near Newhaven in Sussex. On 15th July 1852, Mark Wynter married Ellen Marchant (born 1828, Alfriston) the daughter of Ann and William Marchant, a harness maker, at the family's local church in Alfriston. 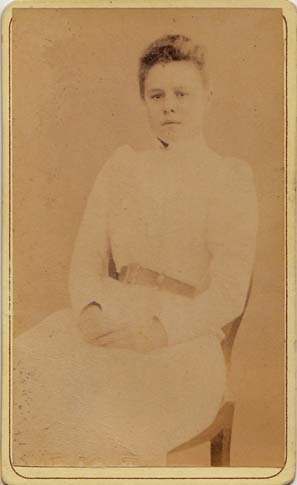 Kate Ellen Wynter, their first child was born in Newhaven and baptised at Alfriston on 9th October 1853. By the following year, Mark Wynter had established a chemist's shop in Brighton. A trade directory of 1854 lists Mark Wynter as a "Chemist and Druggist" at 60 Upper North Street, Brighton. 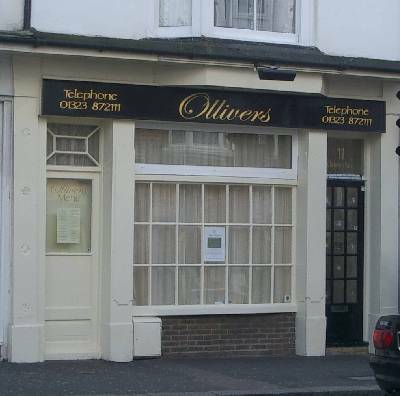 A few years later, Mark Wynter had acquired a chemist's shop in the High Street of Seaford. A second child, named Annie Hephzibah Wynter, was born in 1855 and baptised at Alfriston on 29th April 1855. On 21st April 1857, Ellen Wynter gave birth to a son, who was christened Arthur George Wynter at Seaford's church on 21st June 1857. Sadly, Arthur George Wynter died before the end of 1857. [Death registered in the September Quarter of 1857]. A few years later, on 13th August 1859, a second son, named Ernest Charles Wynter was born at the family home in Seaford. 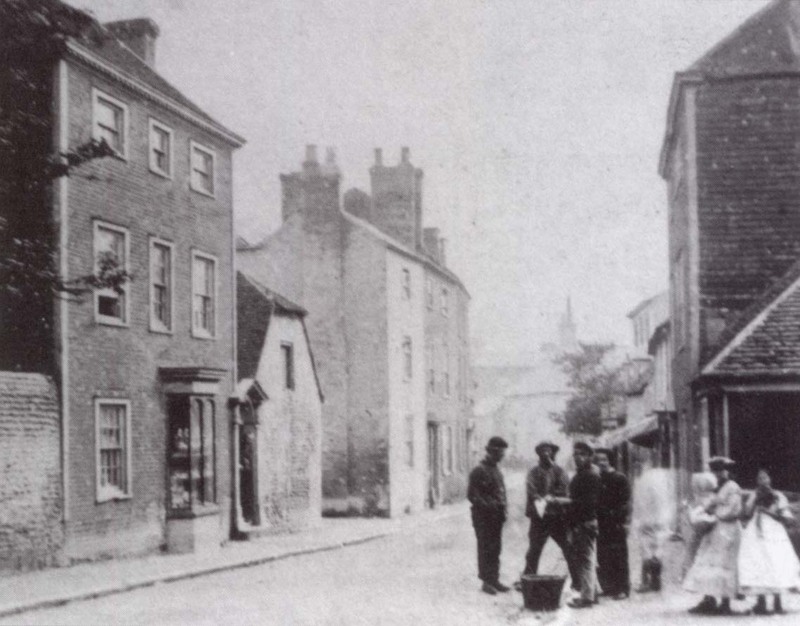 [ABOVE] A photograph of High Street, Seaford, probably taken in the 1860s when Mark Wynter was the only professional photographer in the town. 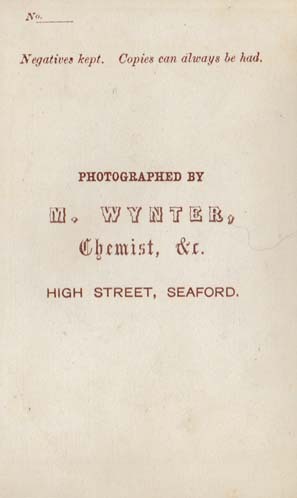 Mark Wynter worked as a photographer from his chemist's shop in Seaford's High Street from around 1862. 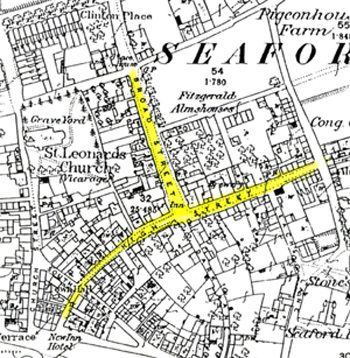 [ABOVE] A 19th century map of Seaford showing the High Street, where Mark Wynter had his photographic studio and Broad Street, where his son Walter Wynter worked as a tobacconist and photographer. 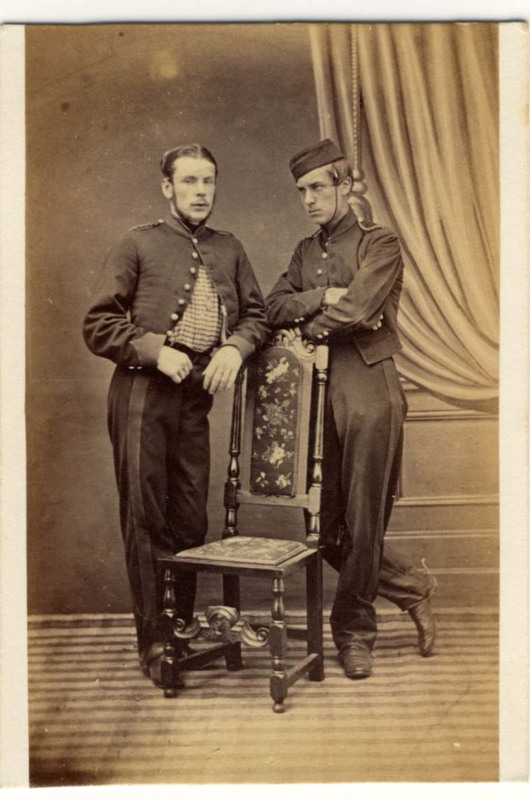 [ABOVE] The trade plate of Mark Wynter, of High Street, Seaford, as printed on the reverse of the carte-de-visite photograph of the two soldiers, below, centre (c1863). Mark Wynter is listed as a photographer at High Street, Seaford, in the local trade directories which were published between 1862 and 1867. 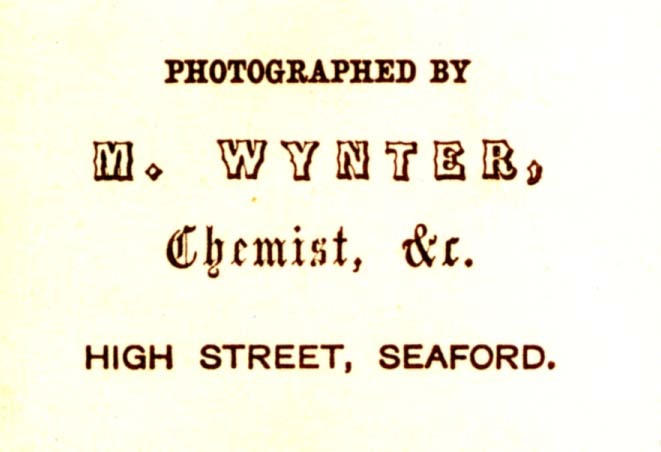 When the 1861 census was taken, Mark Wynter was recorded living with his family in Seaford's High Street, but he gives his occupation as "Chemist & Druggist (Master)" and makes no mention of his sideline in photography. Only one child - one year old Ernest Charles Wynter - was living at home with his parents on the evening of the census. Mark and Ellen Wynter's daughter, Kate Ellen Wynter, aged 7, was staying with members of the Wynter family in Hertfordshire at the time of the census. In the 1860s, Mark Wynter appears to have been the only photographer resident in Seaford. During this period, Mark Wynter mainly produced carte-de-visite portraits at the studio attached to his chemist's shop in Seaford's High Street. Printed on the reverse of the early cartes are the words "Photographed by M. Wynter, Chemist, &c. High Street Seaford". 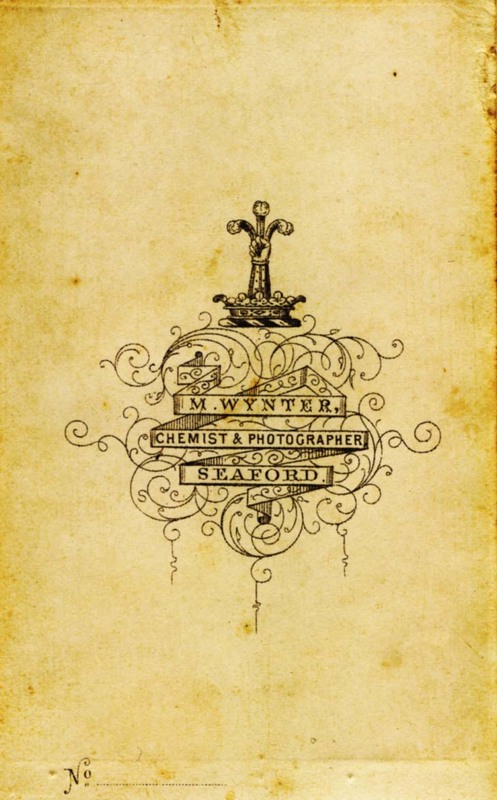 Later examples have a trade plate printed on the back, stating simply " M. Wynter, Chemist & Photographer, Seaford". 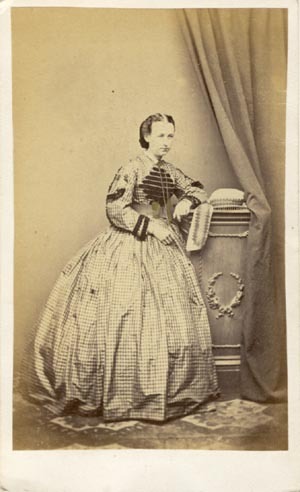 Wynter's career as a studio portrait photographer seems to have come to an end around 1870. Mark Wynter is not listed under the heading of "Photographers" in the Trades Directory section of the Sussex Post Office Directory, issued in 1870. That same year, Mark Wynter's wife Ellen died at the age of 42. [The death of Mrs Ellen Wynter was recorded in the Eastbourne registration district (which covered Seaford) during the 3rd Quarter of 1870. When the 1871 census was taken, Mark Wynter was entered on the census return as a forty-four year old widower, working as a "Chemist & Druggist" in the High Street of Seaford. Living with Mark Wynter at his home in Seaford was his seventeen year old daughter Kate, his eleven year old son Ernest and, the most recent addition to the family, two year old Walter. [The birth of Walter Robert Wynter was registered during 3rd Quarter of 1868]. In 1871, Mark Wynter married for a second time. Mark Wynter's new bride was Elizabeth Adelaide Sage (born c1832, London). [The marriage of Mark Wynter and Elizabeth Sage was registered in the Kent district of Dartford during the 2nd Quarter of 1871]. 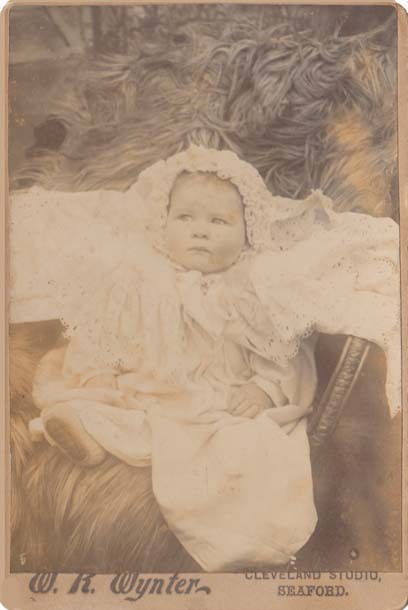 During the late Spring of 1872, Mark and Elizabeth Wynter became the parents of baby girl, who was christened Edith Mary Wynter on 30th June 1872. On the census returns of 1881 and 1891, Mark Wynter is described as "Chemist & Druggist" and no mention is made of his photographic activities. All the photographs in my collection which carry the name "M. Wynter" of High Street, Seaford, can be dated to the 1860s. I have no evidence that Mark Wynter was taking photographs in Seaford between 1871 and 1895. Mark Wynter died in Seaford during the 2nd Quarter of 1895 at the age of 68. It was Mark Wynter's youngest son, Walter Robert Wynter, who was later to become Seaford's resident photographer. Local trade directories record Walter Robert Wynter as a photographer in Seaford between 1893 and 1934. [For further details about Walter R. Wynter's career as a photographer can be found in the panel below]. 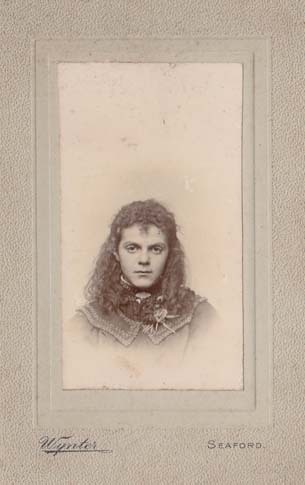 [ABOVE] Portrait of a young woman woman, a carte-de-visite photograph by Mark Wynter of High Street, Seaford (c1865). [ABOVE] Two soldiers in uniform, photographed by Mark Wynter, Chemist of High Street, Seaford. (c1863). 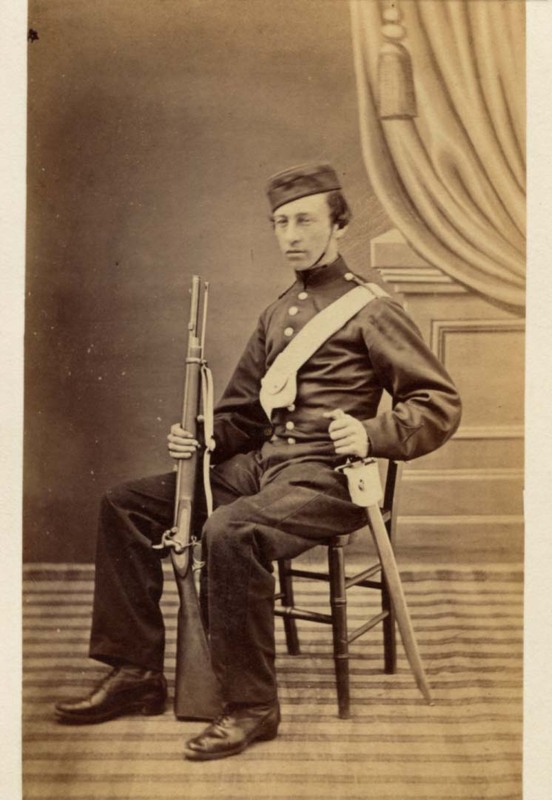 [ABOVE] Portrait of a seated soldier or militia man holding a flintlock rifle and clasping the hilt of a sword. A carte-de-visite photograph by Mark Wynter of High Street, Seaford (c1863). [ABOVE] Portrait of an elderly man seated on a chair. A carte-de-visite photograph by Mark Wynter of High Street, Seaford (c1865). 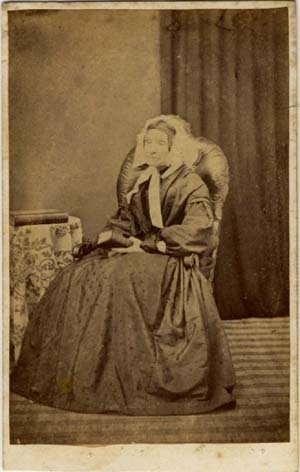 [ABOVE] Portrait of an elderly woman seated on a chair, holding a book. A carte-de-visite photograph by Mark Wynter of High Street, Seaford (c1865). 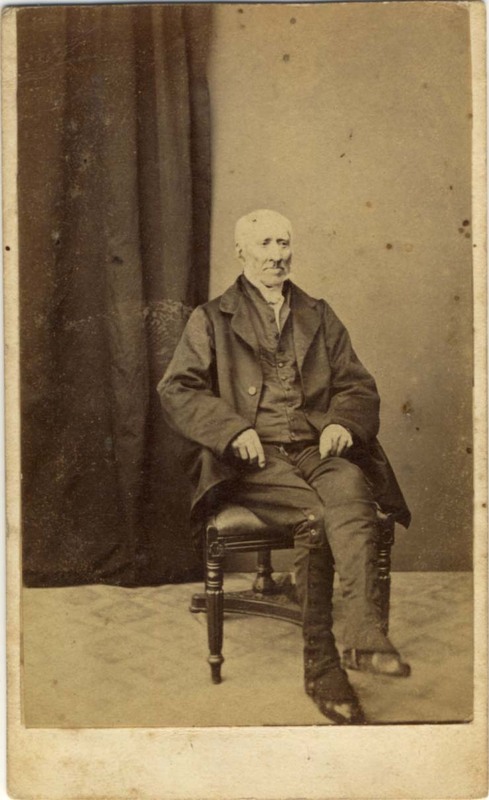 [ABOVE] The trade plate of Mark Wynter, described as "Chemist, &c." of High Street, Seaford, as printed on the reverse of a carte-de-visite photograph (c1863) [ABOVE] Portrait of an elderly man standing by a chair,. A carte-de-visite photograph by Mark Wynter of High Street, Seaford (c1863). [ABOVE] A surveyor photographed at work outside the business premises of Richard and Walter Towner in Seaford's High Street. In the background stands some workmen who have started digging up the road in preparation for the laying of drainage pipes. The survey work and excavations were carried out around 1869. Mark Wynter, who had a chemist's shop to the right of this picture, was probably the photographer who captured this scene. 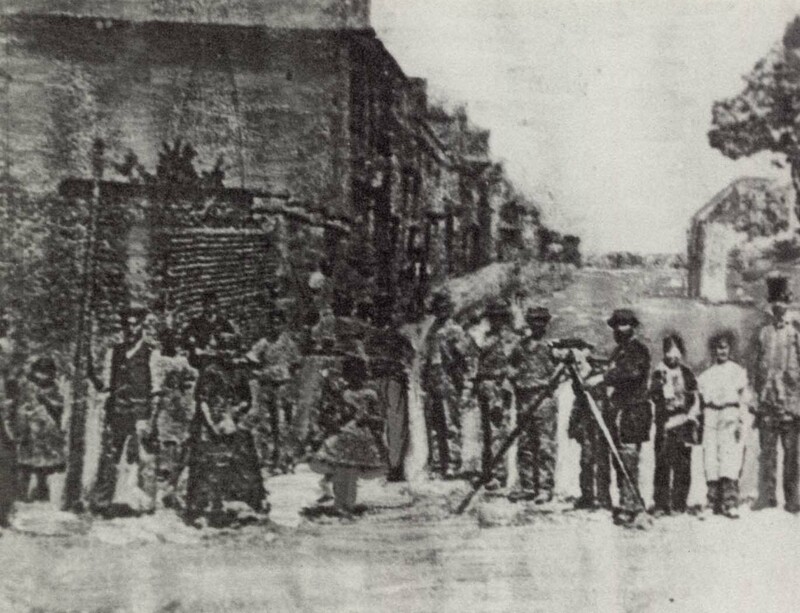 [ABOVE ] A heavily re-touched photograph of 1869, showing a surveyor posing with bystanders at the High Street end of Broad Street, Seaford. 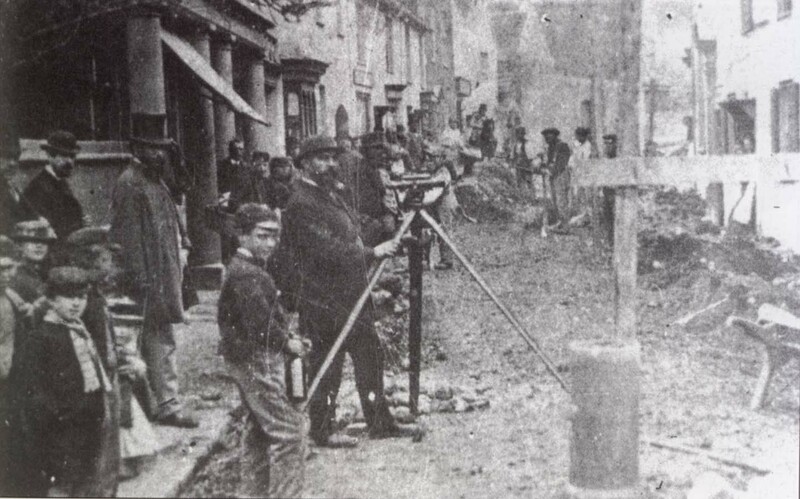 The surveyor with his level or theodolite on a tripod seems to be the same bearded man with the low-crowned bowler pictured in the centre of the photograph opposite. The man with the top hat and smock-like coat on the far right also makes an appearance in the previous photograph. 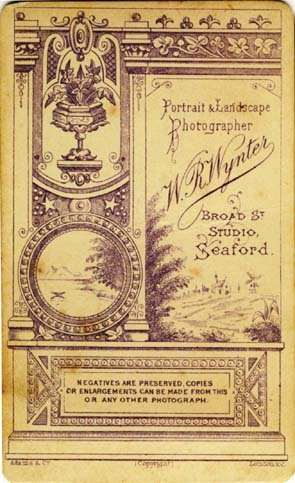 [ABOVE] An advertisement for W. R. Wynter, Landscape & Portrait Photographer of 28 Broad Street, Seaford, which appeared in the book Seaford of the Past by W. R. Wynter and F. R. Gale, published in 1914. 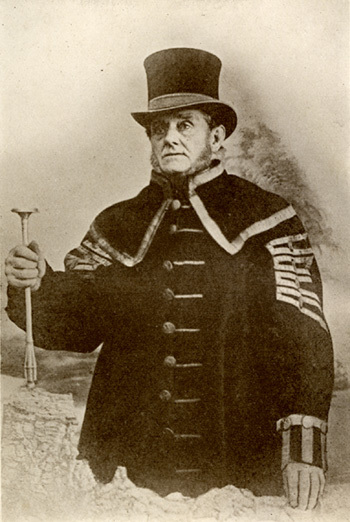 [ABOVE] A portrait of William Woolgar, the last "Sergeant of Mace" in the Town and Port of Seaford. A photograph, presumably taken by Walter Wynter, which appeared in the frontispiece of his book "Old Seaford". William Woolgar (1828-1909) ran an ironmonger's business in Clinton Parade, Seaford for many years. Walter Wynter annotated this photograph of William Woolgar - "Photo taken in the 73rd year of his age. Jan. 22nd, 1901". [ABOVE] The trade plate of W. R. Wynter, Photographer of the Cleveland Studio, Seaford, taken from a cabinet portrait produced around 1905. Walter Robert Wynter was the son of Mark Wynter (1827-1895), Seaford's first resident photographer [see above]. Walter R. Wynter earned his living as a photographer and tobacconist, but he is probably better known today as a local historian and the author of a number of books on the history of Seaford. Walter Robert Wynter was born on 9th August 1868, the second surviving son of Ellen and Mark Wynter, a chemist and druggist of Seaford. At the time of the 1891 census, twenty-two year old Walter Wynter was employed as an assistant at his father's chemist's shop. Walter Wynter took up photography professionally in the early 1890s. The 1895 edition of Kelly's Post Office Directory for Sussex, lists Walter Robert Wynter as a photographer with a studio at Broad Street, Seaford. At the time of the 1901 census, Walter R. Wynter was recorded on the census return as a "Photographer & Tobacconist", aged 32. [ABOVE] The trade label of W. R. Wynter, 'Portrait and Landscape Photographer' of Seaford which glued on the reverse of a cabinet portrait produced around 1900. The 1911 Census records Walter Robert Wynter and his family at 28 Broad Street, Seaford. On the 1911 census form, 42 year old Walter Robert Wynter describes himself as a self-employed "Photographer & Tobacconist" working from home. In 1911, Walter Wynter's youngest son, 14 year old Edward Charles Wynter, was employed as an "Auctioneer's Clerk". At this time, Walter Wynter's eldest son, Cedric Walter Wynter, was boarding at an address in South Croydon. On the 1911 census return, 16 year old Cedric Wynter is described as a "Student on the Stock Exchange". 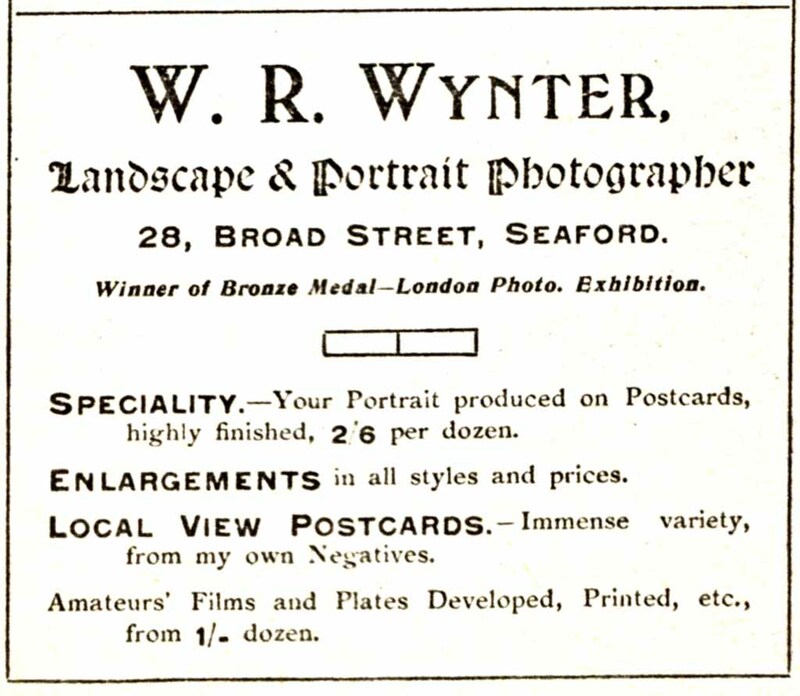 An advertisement published in 1914, describes W. R. Wynter as a "Landscape and Portrait Photographer" based at 28 Broad Street, Seaford. The same advertisement mentions that Walter Wynter was the winner of a "Bronze Medal" at an (unidentified) London Photographic Exhibition. Walter Wynter was keenly interested in the history of Seaford. 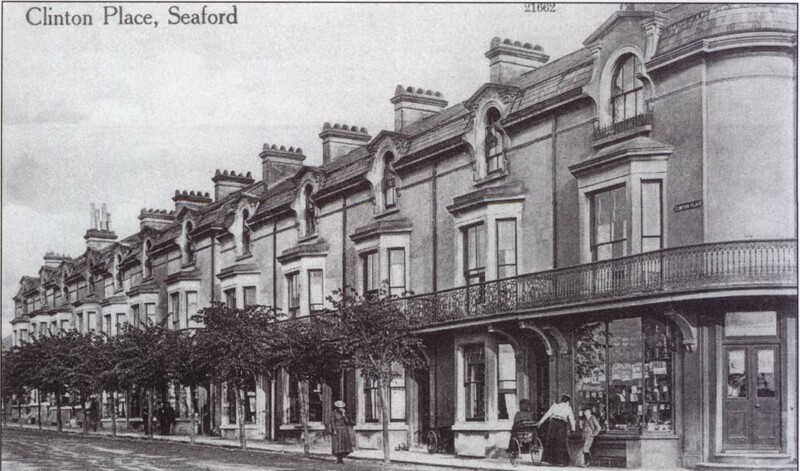 In 1914, Wynter, together with F. R. Gale, co-authored a small book on the history of his home town, entitled "Seaford of the Past". Eight years later, Wynter compiled "Old Seaford", - an account of "Seaford's past glories in the shape of Records, Memorials, Traditions, Customs, etc." Walter Robert Wynter died in 1939 at the age of 70. 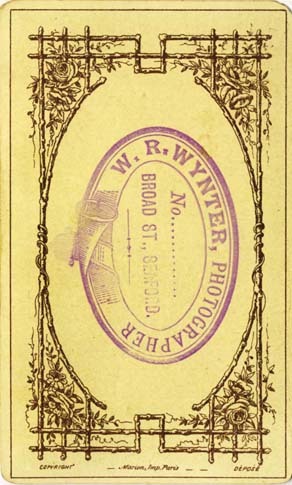 [ABOVE] The trade plate of W. R. Wynter, Photographer of Broad Street, Seaford, rubber-stamped on the reverse of a carte-de-visite photograph (c1894). A few years later Wynter was using a more elaborate and attractive design on the back of his cartes-de-visite. (See bottom of the page). * Both of Walter Wynter's sons served in the armed forces during the First World War. Cedric Walter Wynter enlisted in the 12th Regiment of the Canadian Mounted Rifles at Calgary on 11th January, 1915 and served in the Canadian Expeditionary Force which fought on the Western Front. Edward Charles Wynter served as an Air Mechanic (First Class) in the Royal Naval Air Service . 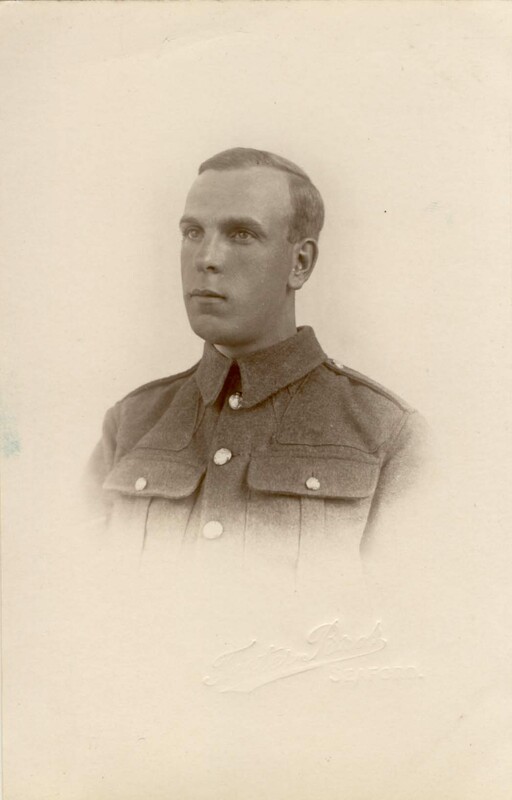 Edward C. Wynter died on 5th February 1916 at the age of 19. 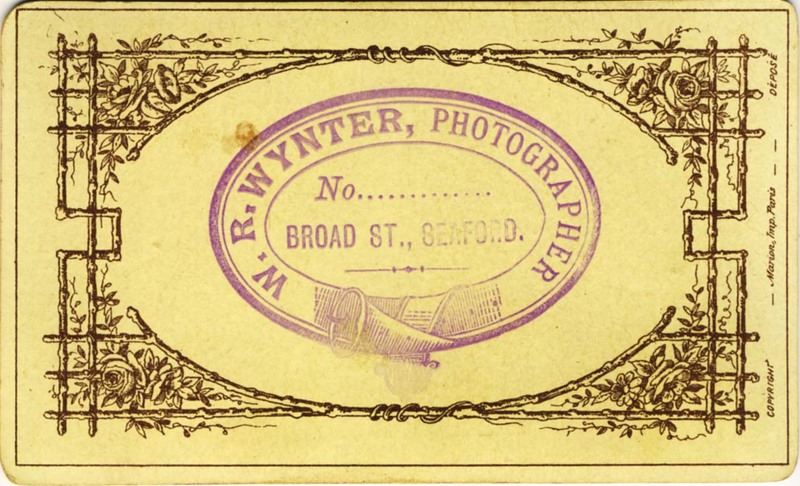 [ABOVE] The trade plate of W. R. Wynter, Photographer of Broad Street, Seaford, rubber-stamped on the reverse of a carte-de-visite photograph (c1893). [ABOVE] Portrait of a young woman seated on a chair, a carte-de-visite photograph by Walter R. Wynter of Broad Street, Seaford (c1893). [ABOVE] The trade plate of W. R. Wynter, Portrait & Landscape Photographer of Broad Street, Seaford, as printed on the reverse of a carte-de-visite photograph (c1895) [ABOVE] Portrait of a young man. A carte-de-visite photograph by Walter Robert Wynter of Broad Street, Seaford (c1895). [ABOVE] Portrait of an unknown girl. A carte-de-visite photograph by Walter Robert Wynter of Broad Street, Seaford (c1902). 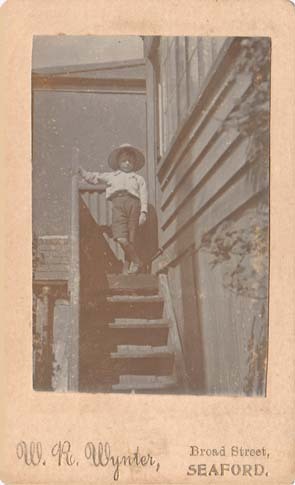 [ABOVE] Portrait of a boy standing on a staircase. A carte-de-visite photograph by Walter Robert Wynter of Broad Street, Seaford (c1905). [ABOVE] A cabinet card portrait of a young child, photographed by Walter Robert Wynter of the 'Cleveland Studio', Seaford (c1896). An inscription on the reverse of the photograph identifies the subject as Patrick York Goble Champion, who was born in Alfriston, Sussex at the end of 1895. Patrick Y. G. Champion was the son of Edith Maude Stringer and Charles Goble Champion (1854-1919), a solicitor & notary, who resided at Dean's Place, Alfriston, during the 1890s. 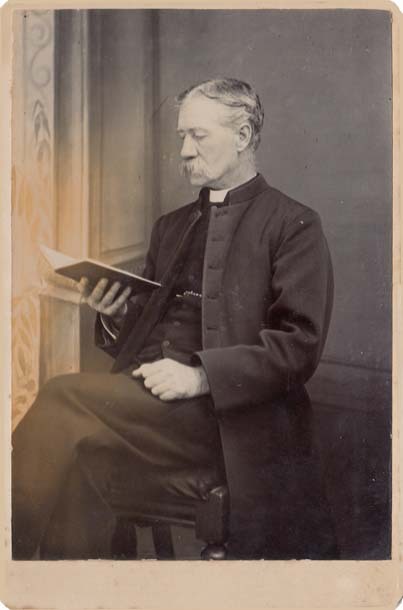 [ABOVE] A cabinet card portrait of a clergyman, photographed by Walter Robert Wynter, 'Portrait and Landscape Photographer' of Seaford (c1900). Walter Robert Wynter was a photographer and tobacconist based at 28 Broad Street, Seaford, between 1893 and 1934. The label on the reverse of this photograph reads "W. R. WYNTER, SEAFORD - Portrait and Landscape Photographer. From around 1896, Walter Wynter called his studio the 'Cleveland Studio". Click here to return to the Directory of Seaford Photographers.